An ancient Chinese legend tells of a brave and tenacious carp who managed swim upstream on a waterfall and to leap over the Dragon’s Gate, along the Yellow River, overcoming obstacles and evil spirits. The gods, impressed by such courage, turned the carp into a large dragon, becoming the symbol of those who aspire to accomplish big things and are not afraid to face the adversities of life. Sicis Atelier created an extraordinary new jewel: the Koi necklace, emblem of constancy and perseverance, that with its celebrated longevity makes it also a symbol of long life. 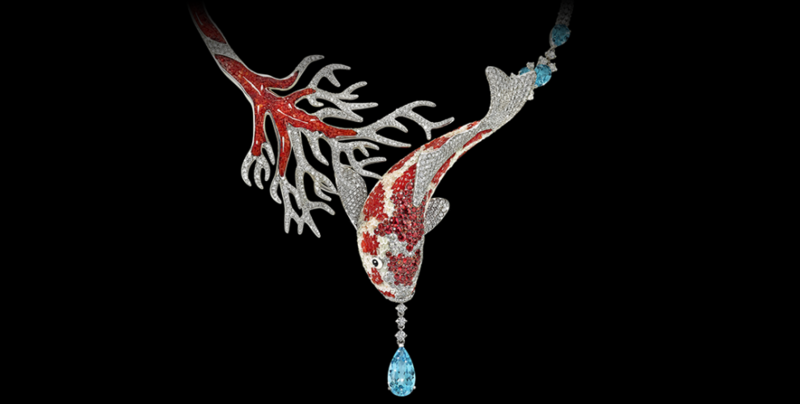 The necklace is entirely in white gold, the branch of coral and the carp are covered in Micro Mosaic, 14,69cts of diamonds and 13,84cts of range sapphires. An additional nicety are deep blue aquamarines, totaling over 7cts, which further embellish the necklace. Great attention is given to detail, adorning the back of the jewel with iridescent mother of pearl. Sicis develops another unique jewel in the world, continuing to express through new creations a great mastery in the art of the goldsmith and in the use of Micro Mosaic technique. In these objects the intrinsic meaning is dense, emphasized by the beauty of the design and the reciousness of the materials used.